No se Pablo – Yo creo desagradable. No me gustan las moscas – GUACALA! Pablo por Dios! Que nota de fotos! Estoy encantada! Definitivamente te has ganado toda mi admiracion! Wow! You are simply amazing! And that is all I have to say! BTW, I still see only one photo! I can see two photos, the second shot is the same first photo but post processed a lot, it’s weird that you can’t see it. Okay, now I see the second photo … the blue one. It’s wonderful too. These are so very artistic in addition to being scientifically elucidating! WOW! Well done Pablo! Amazing detail and symmetry! Esta supera todo, menos una!!! That is a really great capture, Pablo. Was that a lot of patience, or an extreme amount of luck? A lot of patience, I took over 60 pictures to get this one, spent more than 20 minutes on it because the focus is completely manual and that requires a lot of time. This is a most stunning capture! You never cease to amaze me! Super duperclarity and I love the filter work! 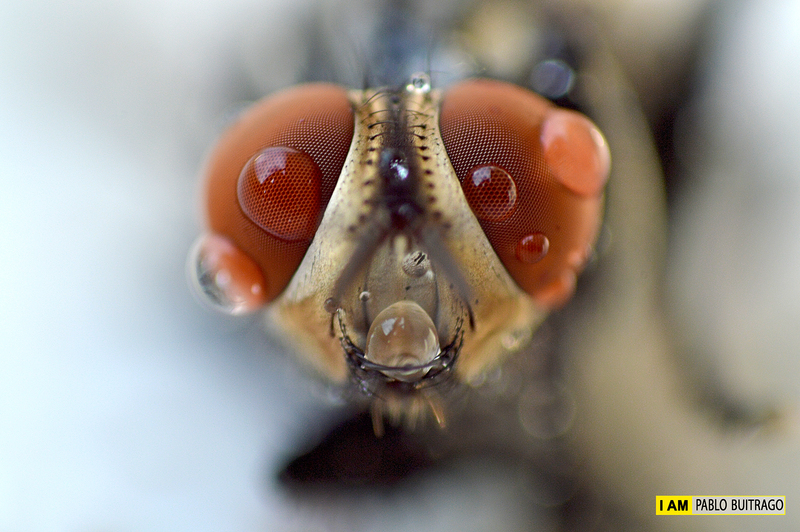 Wow, that’s an amazing macro shot, Pablo! (to be noted here, I don’t like bugs or insects at all, macro or otherwise) Wanted to ask you about that reversed technique: you bought a special ring to reverse the lens, or is it just manual? How do you do it? It’s a special ring that I boudht to reverse the lens, but you have to use your camera in manual mode. There are no more words for these photos! OMG you saw a fly give birth? Euww, but as you say, rather cool too. These pics are amazing. like sci fi. very very cool. wow!!!!!!! superó a la que nos mostraron!! I absolutely LOVE these, Pablo! Fantastic, fantastic! !